Javier Ortega-Hernández (Department of Zoology) discusses what the discovery of the earliest known fossilised nervous system could tell us about evolution. The nervous system is the command centre of an animal’s body, carrying all the complex electrical signals for the actions that keep it alive, such as moving and eating. Because of its critical function, the nervous system also contains a lot of information about an animal’s evolution, and can even help us understand how different groups relate to each other. But preserved fossilised nervous systems from extinct creatures are extremely rare. 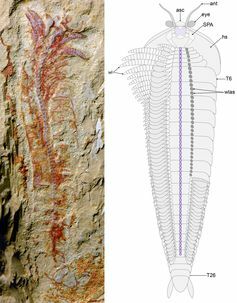 That’s why my colleagues and I were excited to discover one of the most detailed and well-preserved nervous system fossils ever found, from a crustacean-like animal known as a fuxianhuiid that lived more than 500m years ago. These fossils – which come from the Xiaoshiba biota in south China – are so well preserved that you can see individual nerve roots ten times thinner than a human hair. The findings offer the most detailed view of the nervous system in early animals available to date, and inform us about the early evolution of the nervous system in these creatures and their close relatives. The fuxianhuiids (pronounced foo-see-an-who-eeds) were primitive animals known only to have lived during the early Cambrian period in China, some 515-520m years ago. Fuxianhuiids are widely regarded as being important for understanding the early evolution of the arthropods. This is a large group of animals with jointed limbs and hard exoskeletons that also includes insects, arachnids and crustaceans. So finding preserved nervous tissues in fuxianhuiids tells us a lot about their early evolution and that of their close relatives. By painstakingly chipping away small pieces of rock from the fossil using a fine needle, my colleagues in China were able to reveal the ventral nerve cord running through their entire body. The ventral nerve cord is part of the nervous system, very much similar to our spinal cord, and it resembles a string of beads. Each of the “beads” actually corresponds to a ganglion, a condensed mass of nerve cells whose function is to control the legs on each segment of the body in fuxianhuiids and other arthropods. Our fossils also preserve dozens of delicate nerves that emerge at either side of the ventral nerve cord and that would have been connected to the legs and other parts of the body. Finding the fossilised remains of an animal’s nervous system is extremely unusual, as the brain and ventral nerve cord are mainly made of fatty tissues and decay very quickly under normal circumstances. But under exceptional conditions – such as very rapid burial in environments with little oxygen – these delicate structures can be preserved in the fossil record. In the last five years, various studies, have reported the preservation of brains in Cambrian arthropods, which has greatly improved our understanding of their evolution. But in most cases, we can only recognise the broad outline of the brain and so there are limits to the information that can be extracted from the fossils. Our study is the first time that a complete ventral nerve cord has been described in such an extraordinary level of detail. More importantly, the ventral nerve cord of fuxianhuiids is rather unique among arthropods. Whereas most arthropods also posses condensed ganglia, they generally lack the dozens of delicate nerve roots that are found in fuxianhuiids. However, this peculiar organisation can be found in velvet worms (or onychophorans), a group of animals resembling worms with legs that are cousins to the arthropods. So the fuxianhuiid ventral nerve cord is an intermediate between the nervous system of arthropods and velvet worms. By contrast, the presence of ganglia on the nerve cord of fuxianhuiids is an innovation that occurred in the evolution of arthropods. Keeping with the analogy, this is like how feathers are an innovation that occurred in the evolution of birds. The most interesting conclusion we can draw is that the origin of the arthropod nervous system required the dramatic reduction in the number of nerves, and that this event took place after the early Cambrian period. Without fuxianhuiids, it would have been impossible to attain this depth of knowledge on the evolution of the nervous system. Top: Complete specimen of Chengjiangocaris kunmingensis from the early Cambrian Xiaoshiba biota of South China. Bottom: Magnification of ventral nerve cord of Chengjiangocaris kunmingensis.